The Sacrament of Marriage – Ruth Bell Graham | It's the Women, Not the Men! 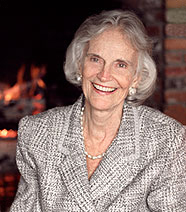 Ruth Bell Graham (1920-2007) – Wife of Evangelist Billy Graham, Mother of Five, Author, Poet and Artist. A good marriage takes 3! Husband, Wife, and Jesus! Well said. Unless we can forgive we cannot be happy in our marriage. Yes. I agree. It is essential to a happy marriage. But, the key is that, not only do both husband and wife forgive, but both repent as well.